Hear ye, hear ye! You are invited to a royal celebration celebrating the princess & knight of the Royal Kingdom! Do you have twins (a boy and a girl) or children with birthdays close to each other? Have you ever planned a co-ed birthday party for them? 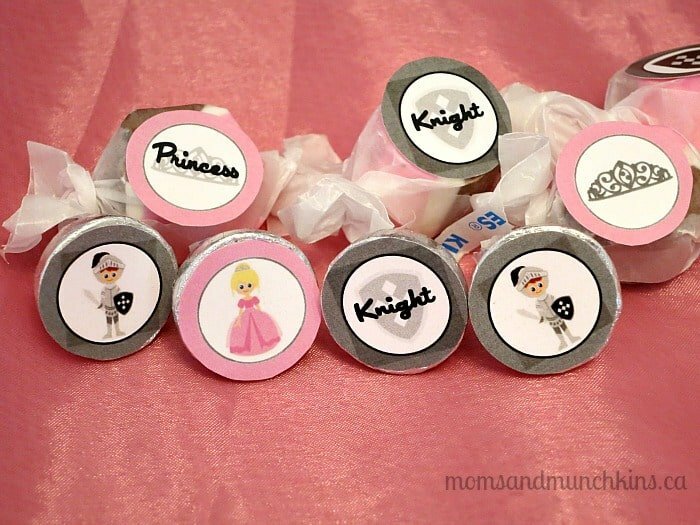 These Princess & Knight birthday party ideas are perfect for a co-ed party. 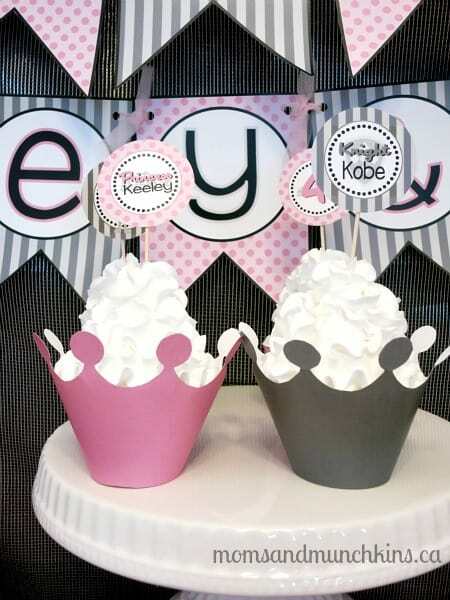 Here I’ll share ideas with you on invitations, decorations, food, activities, favors and more. All of the printables featured here are by the creative Holly with Mimi’s Dollhouse. 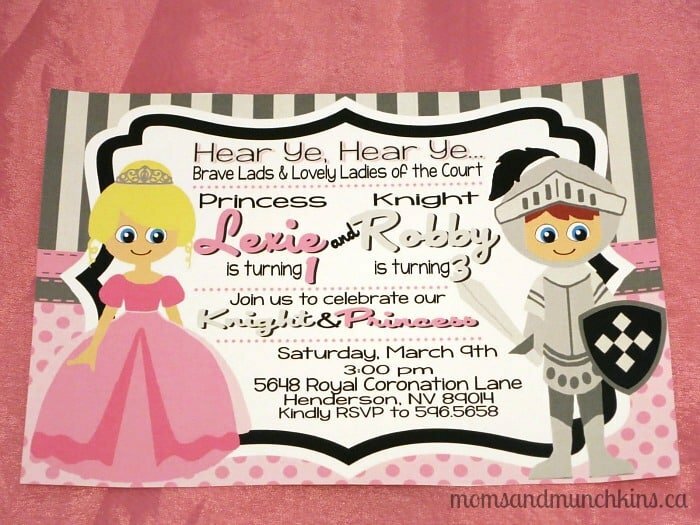 These adorable invitations incorporate both the birthday princess and the birthday knight. For a cute royal touch, seal the envelope with an embossed stamp. 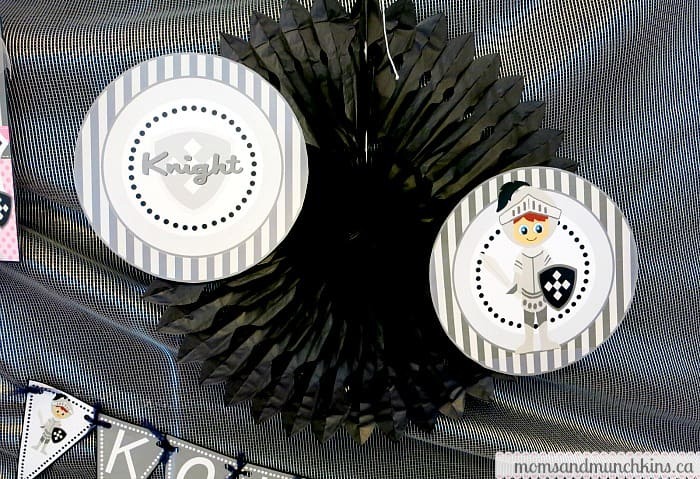 The mini printable circles (for Hershey’s kisses) can also be used as stickers on the outside of the invitation’s envelope. This Welcome sign makes a great hanging for your front door. Simply punch a hole in both the top corners and loop a piece of tulle through it to hang. I used this for a party booth area of the party – I’ll share more about this in the activity section. 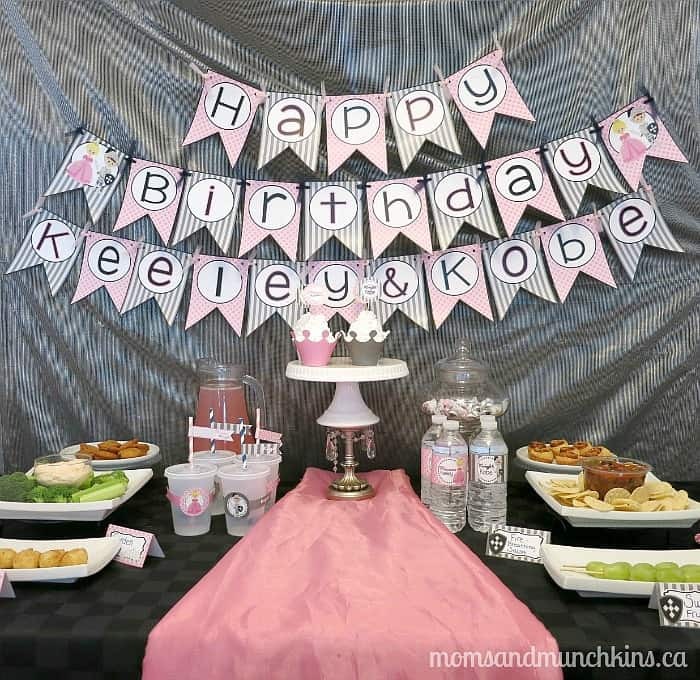 A personalized banner is always a cute addition above the buffet table. 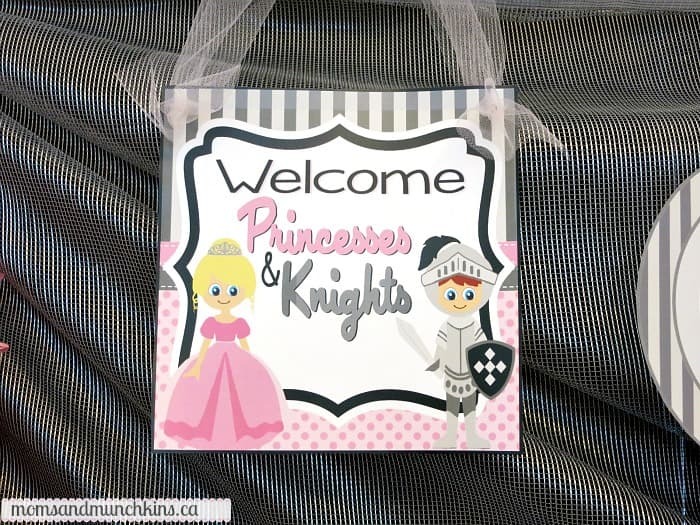 Ribbon or tulle can be used to string the banner together. This can be placed directly on the wall or can be pinned to a curtain backdrop (I used a silver shower curtain for this backdrop). 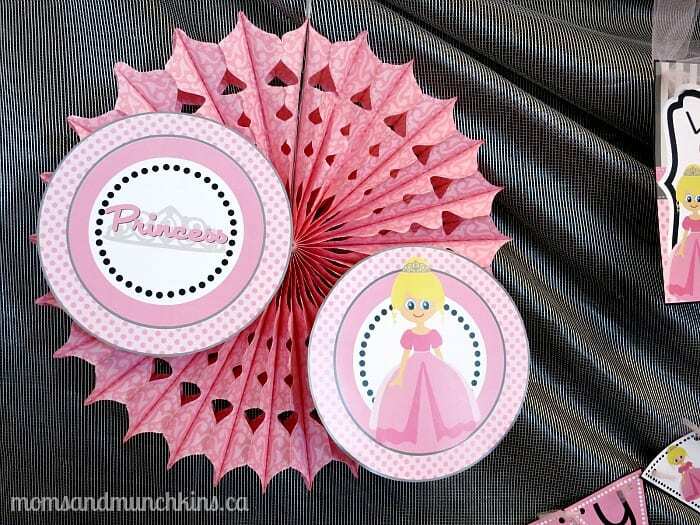 The large circle cutouts can be used to glue onto large pink, black or silver paper fans. 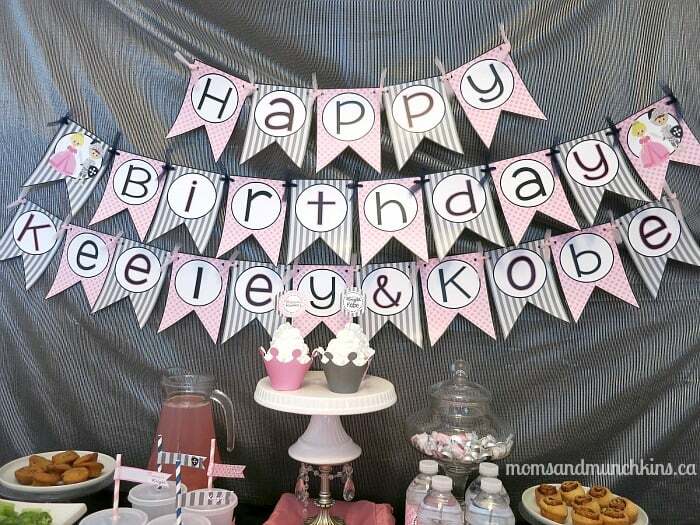 It’s a quick and easy way to personalize a basic party supply! 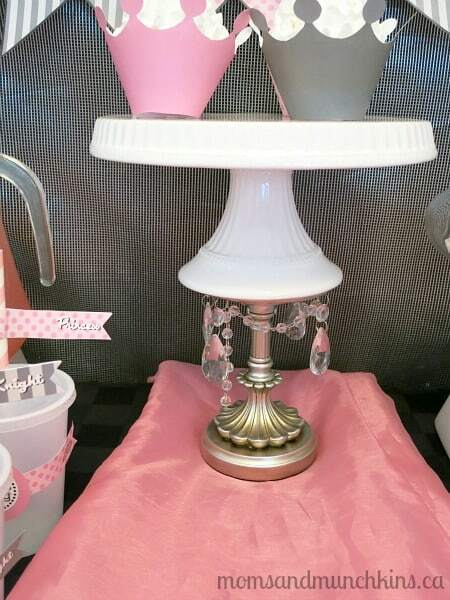 Jeweled candle holders can be used to hold cake stands and serving trays. Can you guess what this table runner is? It’s an old bridesmaid dress! With a little bit of creative thinking, you’d be surprised at how many party supplies you already have in your home. 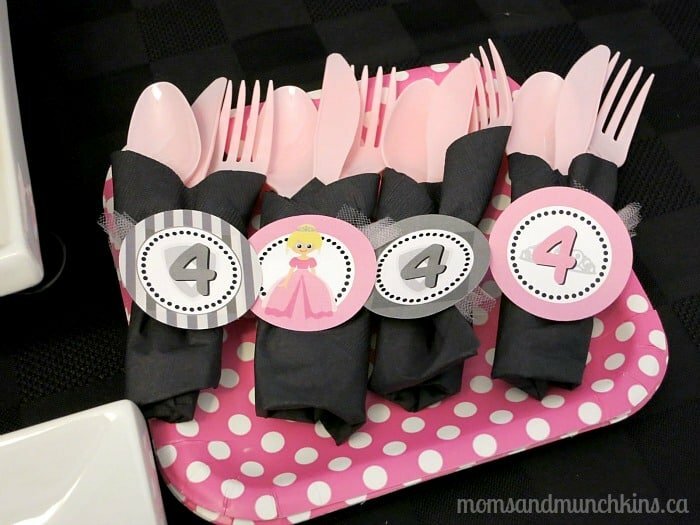 The printable cupcake circles can be used with a tulle ribbon to create custom napkin holders. When planning food for a party, I always start by brainstorming words that remind me of that particular theme. For example, when I think of princesses I think of tiaras, a royal ball, flowers, etc. 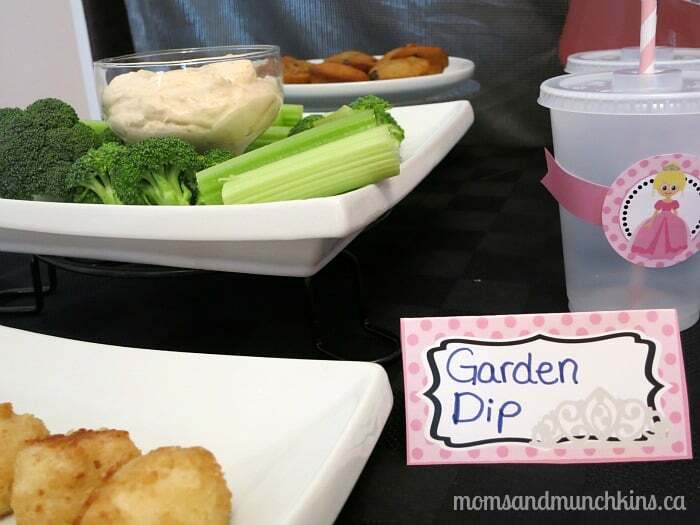 With this in mind, I decided on a simple chicken ball appetizer labeled “Royal Ball” and a vegetable & dip platter labeled “Garden Dip”. 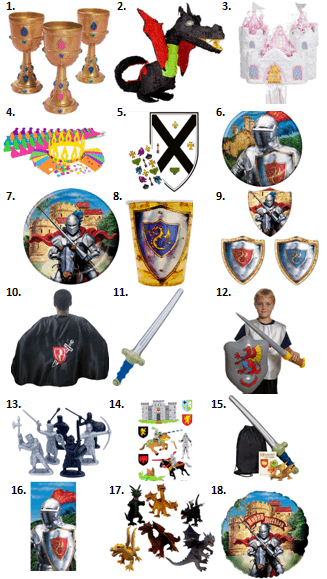 When thinking of a knight, I think of fire-breathing dragons, suit of armor, swords, etc. 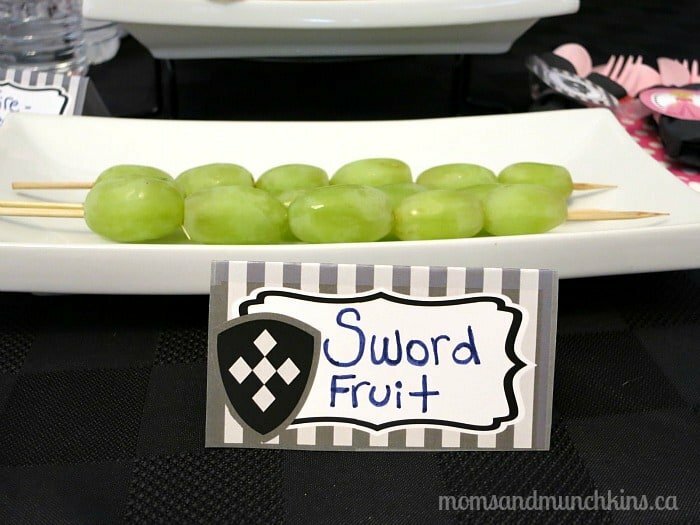 so I decided to include a salsa labeled “Fire-Breathing Salsa” and fruit kabobs labeled as “Sword Fruit”. 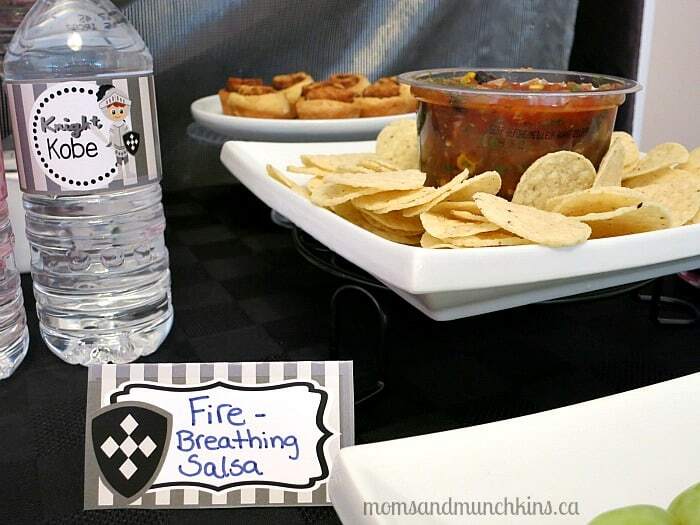 The printable food tent cards let you create your own special names for the party food. 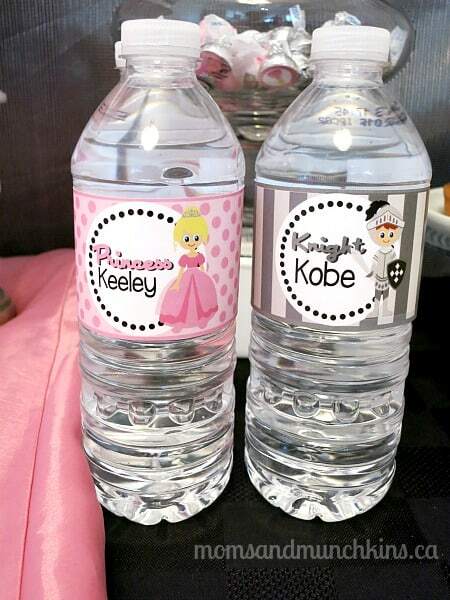 Water bottle labels can be used to dress up bottles of water or pop. 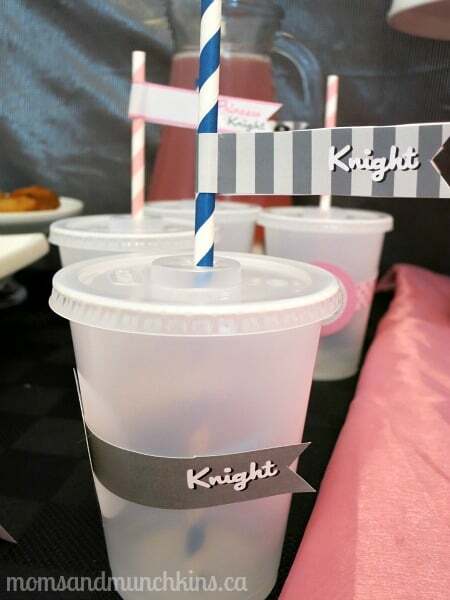 Cupcake circles and straw flags can be used to dress up plain plastic cups (straw flags can also be used like a ribbon around the cup). 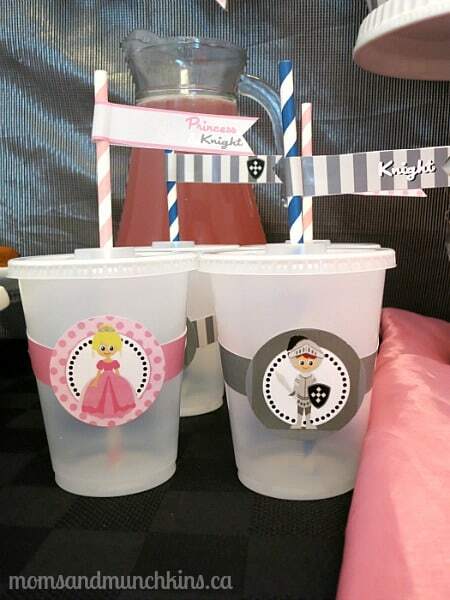 The straw flags make a cute addition to black and pink striped straws. Photo booths are always a fun idea at a party and the photos make a great addition to the thank you cards that you’ll send after the party. 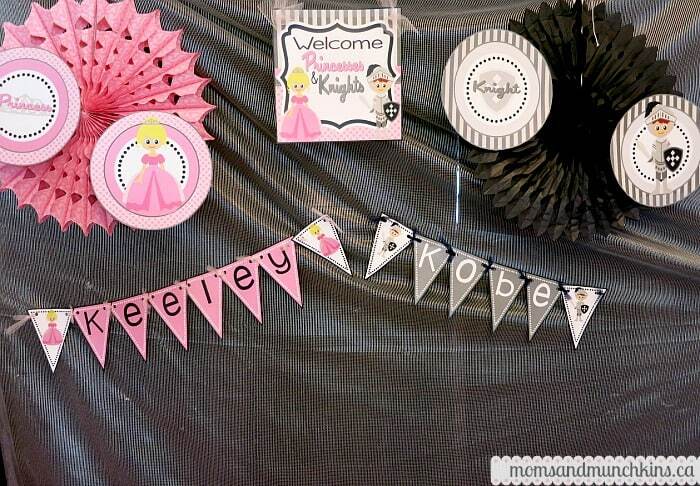 For this photo booth, I used a silver shower curtain backdrop, the welcome sign, paper fans dressed up with the printable circles and the mini banners with the birthday girl and birthday boy names. 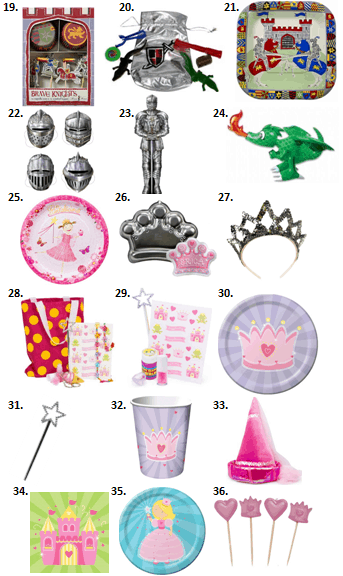 Here are some more fun ideas for party supplies, decorations, favors and more! *Disclosure: I am part of the Amazon and Birthday in a Box affiliate programs. 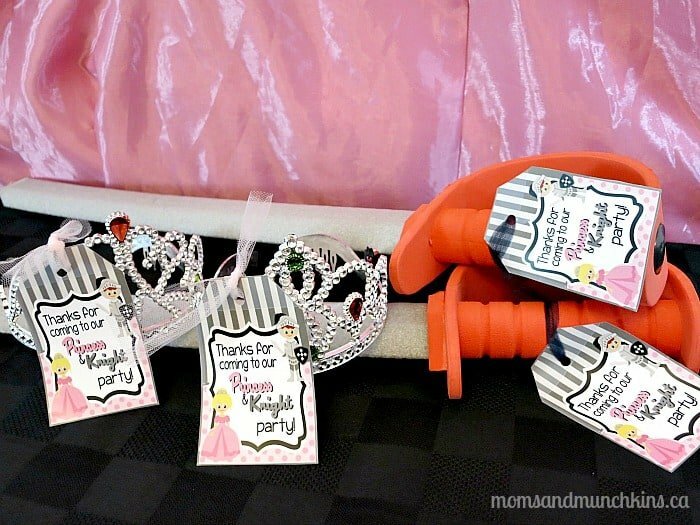 The printable party set by Mimi’s Dollhouse was provided to me free of charge. All opinions expressed here are my own. Thanks, Catherine! Mimi’s Dollhouse did such a great job on these printables. 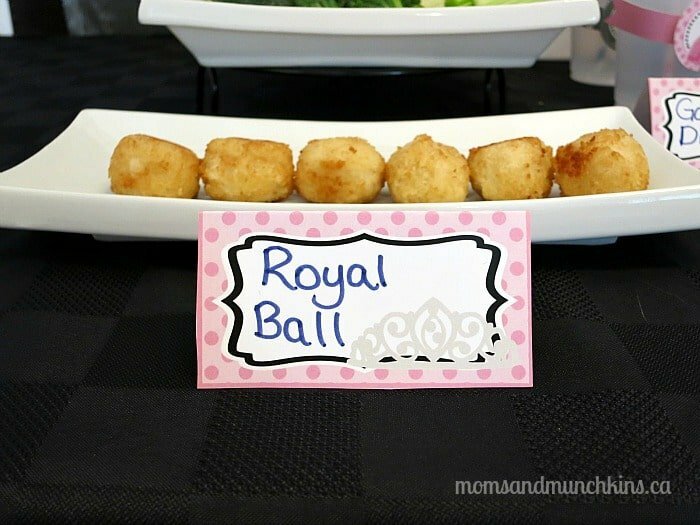 I had only heard of co-ed parties recently and now I have so many fun ideas for more!